Meet Nykaa's Pout Perfect Velvet Matte Lip Pencil, a triple-action crayon that does it all! This perfectly pigmented crayon gives you the coverage of a matte lipstick, precision of a liner, and blend-ability of a blusher. The blend of Vitamin E and Shea Butter creates a plush texture that adds youthful plumpness in one hot minute! Line, fill and dab some of it on your cheek for a naturally flushed look. Nykaa Pout Perfect Lip & Cheek Crayon - Please Plum Me -01:Our Nykaa Pout Perfect Lip & Cheek Crayon in Please Plum Me will make you look a fine wine! This delicious plum shade is handpicked to flatter all skin tones. Go ahead, let your lips look luscious like freshy picked berries! Nykaa Matteilicious lip crayon - Fired Up 08 : Don?t try to tame her, set her wild and free! 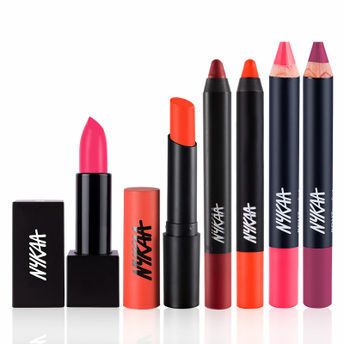 Nykaa MATTE-iliicous Lip Crayon in Fired Up is a bright orange that is too hard to not notice! Don?t let anything hold you back, go and get it! Game, Set, Matte! Fall mattely in love with our Nykaa Matteilicious Crayons. These lip crayons boasts a remarkable formula that pushes the boundaries of color intensity with an extreme matte formula. This supreme formula glides on your lips effortlessly giving you that matte finish that you've always craved for! Nykaa Matteilicious Lip Crayon - Hot As Red : Get the temperature soaring with our Nykaa Matteilicious Lip Crayon in Hot As Red. This flaming hot red hue is all you need to make your man count his blessings! Swipe this gorgeous hue on and set things on fire. Why Should You Make It Yours: Nykaa Matteilicious Lip Crayons is the perfect way to get that gorgeous matte pout! This cruelty-free, and high-pigment formula gives you an intense matte finish that lasts for hours without fading or feathering! The unique formulation ensures that your lips stay comfortable, colored up and matte-smooth all day long! Bonus: These vivid, full-coverage hues are hand-selected and named by our In-house Nykaa Panel to ensure your lips look as gorgeous as you! Also, these babies will ensure you look fabulous without breaking the bank. Go ahead, grab em'all! Nykaa Pout Perfect Lip & Cheek Crayon - Ken To My Barbie 18 : Get playful, get glamorous! If there is one shade that can never go wrong, then it is this cutesy pink hue. As romantic, as Ken's love for Barbie, this shade is ought to make any look absolutely gorgeous!